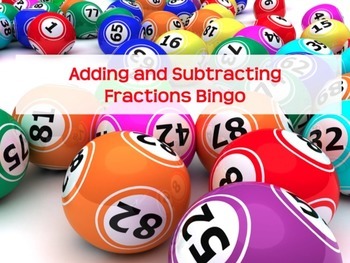 Bingo game containing 25 addition and subtraction problems using fractions. Game includes proper fractions and mixed fractions. Kids love to play bingo and in my room they get candy with a bingo which they love, since I do not give candy for free! Multiple problems are on a page so that students do not feel rushed to get an answer. Included in zip file: Flipchart with bingo problems, bingo cards, and a work packet.